Typical barbecue smoking involves heat, with the most common temperatures ranging from 225 to 250 degrees Fahrenheit. Foods such as ribs, pork shoulders, and beef brisket are cooked at these temperatures for extended amounts of time. The resulting food is extremely tender with a touch of smoky flavor. Well, what should you do when you want to smoke a more tender food product – one that might melt at these temperatures, such as cheese? This is where cold smoking comes into play. It's an interesting concept, since generating smoke usually requires fire, which equals a lot of heat. However, with some simple instructions, you can infuse cheese with smoky flavor while maintaining a relatively low heat. Smoked cheeses are considered a high-end delicacy and can cost quite a bit more than regular cheese. The beauty of doing this yourself is that you can buy cheap grocery-store cheese and significantly improve the quality by adding some smoke flavor to it with these methods. There are two easy methods for smoking cheese at home. 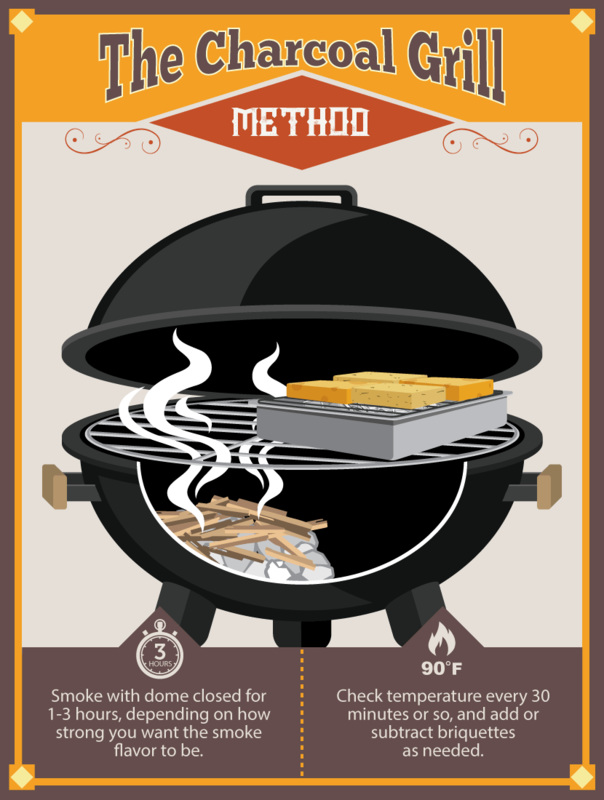 One method utilizes charcoal and smoke wood on a charcoal grill or smoker, and the other uses an electrical heat source situated on a gas grill with smoke wood. Regardless of the method used for smoking cheese, the key is to keep the temperature below 90 degrees Fahrenheit. The cheese will not melt at this temperature. However, to protect your cheese from an unanticipated burst of heat, the general setup includes setting a cooking grate or a cake cooling rack on top of an aluminum tin that is full of ice. The cheese will sit on the grate or cooling rack and the smoke will roll around the cheese. The tin of ice will provide a buffer for any high heat that might travel over to your tender cheese. In my opinion, using a charcoal grill is the easiest way to smoke cheese. On one side of the grill or smoker, light about three to six charcoals and let them mostly ash over. Then put a handful of wood chips on top. 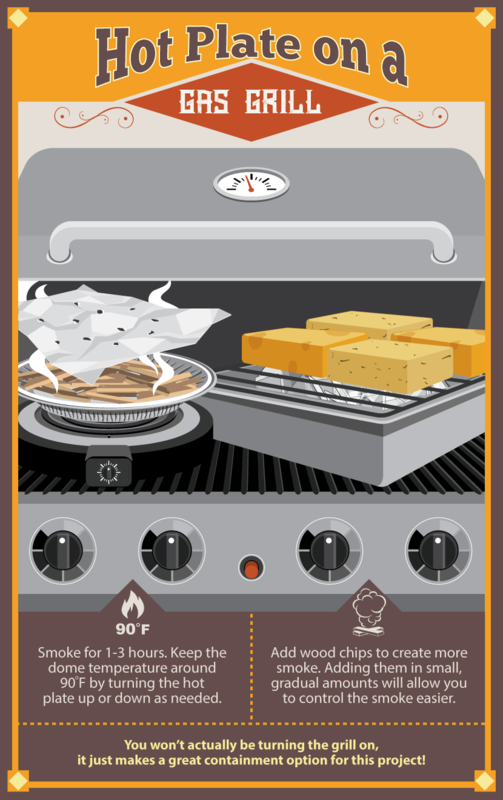 It is helpful to have a removable grate or an area of the grill where you can readily access the fire to add more wood in case the smoke stops. Within the grill, position the aluminum tin full of ice, with the grate and cheese as far away as possible from the heat source. For a standard charcoal kettle, it is ideal to have the heat source on the right and the tin with cheese far to the left. 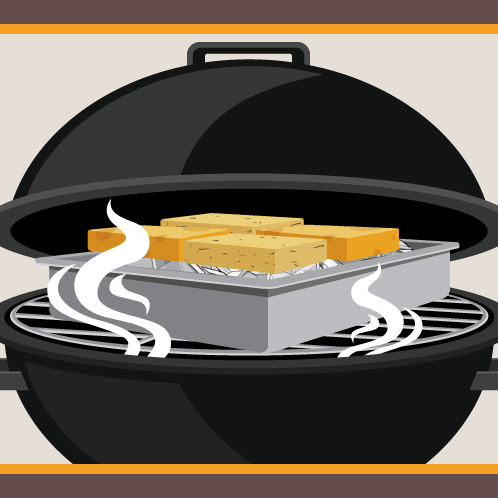 A smoker is usually larger and will allow you to have a greater distance between the heat and the cheese. The most important thing is that the air temperature does not exceed 90 degrees Fahrenheit. You also don't want the charcoal fire directly under the aluminum tin, as you will melt your ice rather quickly. 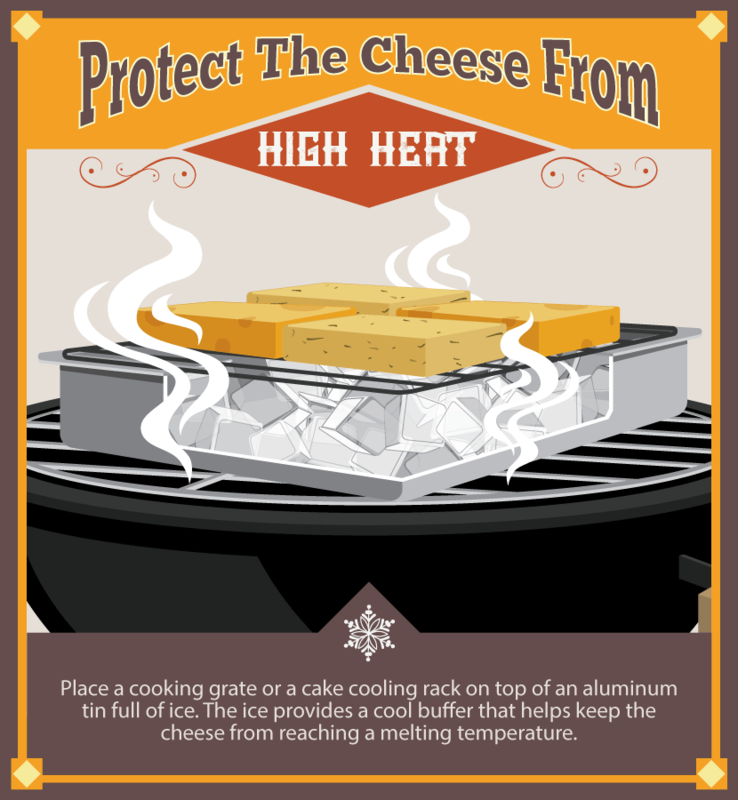 After the coals are lit and the wood chips are placed on top, quickly assemble the aluminum tin and position your cheeses on the grate. Allow enough room between cheese blocks for the smoke to travel all around the cheeses. Close the dome of the grill immediately and allow the system to smoke. If the smoke dies down after about 20 or 30 minutes, simply add one or two more unlit charcoal briquettes and another handful of wood. This should give you another 20 or 30 minutes of cold smoking. Every system will be different, so if you need to add some more wood that's fine. If six coals are too much, back it down to two or four. How long to leave the cheese on is a personal decision. If you want your cheese really smoky, you might want two to three hours. If you want a milder amount of smoke you can keep it to one or two hours. About halfway through the smoking process, rotate the cheeses on the grate (moving front to back and flipping the cheese blocks). If you don't have access to a charcoal grill, you can do the same cold smoking setup on a gas grill. The odd thing about this method is that you aren't using the gas grill for a heat source. Propane heat, even on the lowest setting, will get you over 90 degrees Fahrenheit. Because of this, the gas grill is just used as a smoke containment device that is outdoors (imagine your significant other seeing you set this up in your kitchen oven!). This method utilizes a low-heat 750 watt electric hot plate. Set the hot plate directly on the gas grill cooking grates. On top of the hot plate, set an aluminum pie pan full of wood chips. Cover the tin with aluminum foil with about five to ten holes poked on top. The foil cover will prevent any flare-ups from the smoldering wood. Set the hot plate up on the far left side of the gas grill. On the far right, set up the aluminum tin full of ice and the extra grill grate or cake cooling rack, and on top of that place your cheeses. Every hot plate is different, so some experimentation is needed. Start off with a low heat, just enough to generate smoke. Keep an eye on the grill dome thermometer, and if the temperature exceeds 90 degrees Fahrenheit then turn the hot plate down. The idea is to have the temperature of the hot plate high enough to generate smoke from the wood chips but low enough to keep the grill dome temperature below 90 degrees Fahrenheit. Similar to the charcoal cold smoking method above, you can smoke for one to three hours. If you run low on smoke, you can always add some more wood during the cook. This one comes down to personal preference. You can smoke any type of cheese that you like. The most popular cheeses to smoke include Mozzarella and cheddar. However, I have had great results with American, Monterey Jack, Gouda, Brie, Swiss, and even Gruyere. Bulk warehouse stores offer good deals on big chunks of cheese. If the cheese block is too big, you will need to cut it in half or into smaller pieces to allow the smoke to penetrate more evenly. Low-cost grocery store cheese is the best because even though the flavor isn't so great on its own, when you add the smoke it becomes absolutely amazing. In general, the most common smoking woods include hickory, mesquite, apple, and cherry. Certainly there are other varieties, but these are the most common that are sold in wood chip sizes in local stores. An important distinction is the difference between wood chips and wood chunks. The chunks are too large for this application. The chips are small and will smolder with less heat without catching fire. Apple and cherry tend to be more mild smoke flavors, while hickory and mesquite tend to be stronger. A milder smoke will be less noticeable, while a harsher smoke will be a dominant flavor. My preference is that a stronger flavor of cheese will require a more mild smoke. For example, an extra-sharp cheddar cheese, in my opinion, only needs a mild apple wood smoke, while a Monterey Jack cheese can handle a stronger mesquite wood smoke. Again, it's totally personal preference. When the smoking process is over, the cheese isn't ready to eat just yet. Wrap the cheese with cling wrap or vacuum seal it. Place the cheese in the refrigerator for about three days. This step lets the smoke penetrate into the cheese a bit. These few days significantly change the smoke taste of the cheese. Just like smoked meats, the refrigeration process seems to enhance the smoke flavor. It might take some willpower, but try to forget about that cheese for a few days. You will be rewarded. One of my favorite things to do with smoked cheese is to serve it as an hors d'oeuvres with grilled sliced sausages. Another option is to make a grilled smoky flat-bread pizza. Place a flat bread on the grill and add any toppings you like, along with some sliced smoked Mozzarella cheese. Once you have a good supply of smoked cheese built up, there's no limit to the create ways to serve it!